William Augustus Guy (1810-85) was a British physician and medical statistician and President of the Royal Statistical Society from 1873-1875. 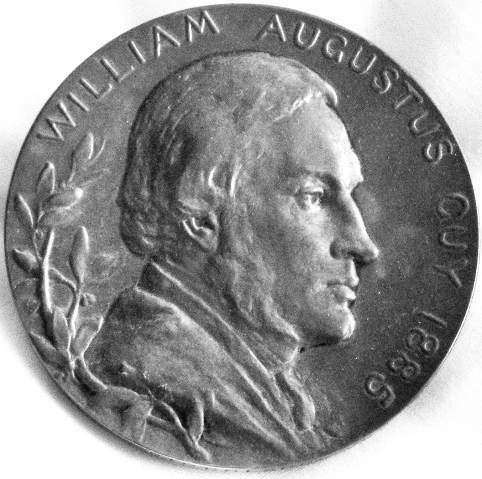 The medal was commissioned by the Royal Statistical Society to commemorate his death. The specific medal was awarded to Joseph Shield Nicholson, M.A., D. Sc., F.E.A. 1918, which is stamped on the rim of the medal. Shield (1850-1927), was an English economist. Important Arts and Crafts Furniture and Works of Art, English, Foreign and European Bronzes 1830-1930. Sale catalogue of 18 May 1975. London: Sotheby's Belgravia, 1975. No. 33.